A channel letter sign is a great way to advertise your business at nighttime as well as in the daytime. 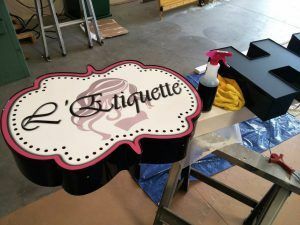 L’Etiquette Hair Salon was opening up in Tarzana, California, and they reached out to us for exterior and interior signs. For the exterior sign, they wanted a front-lit channel letter sign. 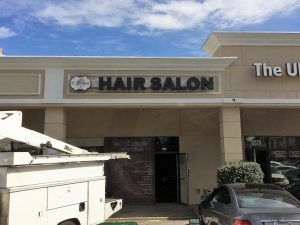 As you can see from the photos, there is a front-lit channel letter box for the logo, and “HAIR SALON” is a set of front-lit channel letters. 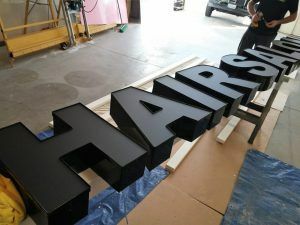 The client had a general idea of what they wanted the sign to look like, but there were a couple of changes to the design during proofing. The original design of the logo had “L’Etiquette Hair Salon” inside of the logo, and “HAIR SALON” in pink. As “hair salon” was being repeated, they decided to just have “L’Etiquette” in the logo and the larger channel letters could complete the business name. During proofing, we also changed the faces of the letters from pink to black. However, we used day and night vinyl so the letters would be black in the daytime but white at nighttime. We achieve this effect by making front-lit channel letters with white acrylic faces and white LEDs. The day and night vinyl is perforated so when the letters are internally illuminated at nighttime, the faces illuminate white. The front-lit channel letter box for the logo also has a base of white acrylic, and the logo was digitally printed onto translucent vinyl. In order to make it more saturated as the LEDs can wash out the color a bit, we did an overprint on top of the original print. We bent the returns to the unique shape of the logo, and the trimcapped faces are attached to the returns. 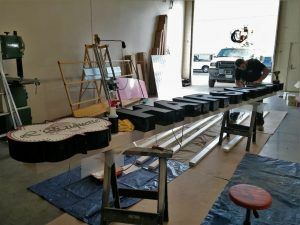 As you can see from the in-shop photos, the sign was attached to a raceway first, then the entire raceway was installed at once.